CinCin Ristorante’s renowned Executive Chef Andrew Richardson believes the essence of Italian cuisine is cooking in rhythm with the seasons and allowing fresh, local ingredients to shine. CinCin: Wood-Fired Cucina showcases the restaurant’s signature wood-oven cooking techniques and Chef Richardson’s traditional Italian dishes married with seasonal west coast flavours, photographed by Kevin Clark Studios. The internationally-acclaimed Argentinean chef, Francis Mallmann, has provided a foreword to Chef Richardson’s inaugural cookbook, which is now available for purchase. 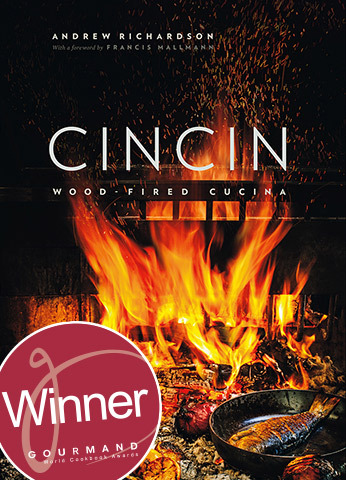 CinCin: Wood-Fired Cucina is sold at fine booksellers, in person at CinCin Ristorante, and through online retailers. View all Toptable Group cookbooks.